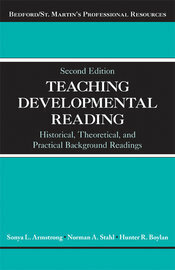 The second edition of Teaching Developmental Reading offers readings ranging from the historical foundations of the field to the latest scholarship in developmental reading. Arranged thematically, each section features an introduction contextualizing the readings, as well as headnotes for every article. The articles provide different perspectives on topics of special interest to developmental reading instructors, and the collection offers a mix of historical, theoretical, and practical works. The editors also provide a list of additional professional resources, including a list of journals that cover college developmental reading scholarship, as well as descriptions of professional organizations that support those interested in college reading and learning instruction.